The study was conducted between 2006 and 2007 at Agulli forest reserve in Northwest Province of Cameroon to evaluate its floral composition through forest edge and interior analysis. Using a sampling intensity of 2.2%, two sample plots of 1 ha each were demarcated in the forest which has a total land area of 89.24 ha. One plot was located at the left exterior edge, while the other plot was located in the interior of the forest. Each of the plots was subdivided into 20 plots (size, 20x25 m). In each of the subplots, all trees that were 10 cm dbh and above were identified and their dbh measured. Thereafter, parameters such as minimum area, species diversity/dominance index, importance value index and regeneration potential were assessed at the edge and interior of the forest. The minimum area at the interior of the forest was 700 m2, while the forest edge has no minimum area which can be taken to represent the community. The species dominance index was 0.18 at the edge of the forest and 0.78 at the interior of the forest. The edge of the forest had 20 families, with the family Euphobiaceae having the highest importance value of 64.9, while 14 families were identified in the interior of the forest, with the family Binoniaceae having the highest importance value of 101.5. Although, the forest edge and interior showed compositional differences in respect of the parameters investigated, however these differences were not significant (p>0.05). The importance of the diversity of forest to the well being of the adjoining communities cannot be overemphasized. It supplies various products, which are consumed by people (Okafor and Lamb, 1994). These include a wide range of edible products obtained from wild fruit trees such as nuts and seeds, used as staple foods or main dishes, as well as those used as minor food supplements, condiments, thickening agents and flavours; leafy vegetables; fresh fruits; fresh seeds; edible oil; spices; fruit-drinks; alcoholic and non-alcoholic drinks (Leakey, 1999). Sustainable management options for most of these forest species and their products are however necessary so as to curb over-exploitation leading to extinction. One of the primary focuses of research in forestry is to provide professionals in charge of tropical forestland management some insight on the structure and functioning of tropical forest ecosystems and the ecology and regeneration of tropical trees that may be important for conserving these forest products (Philips et al., 2002). The role of regeneration as an ecological strategy in structuring tropical tree communities has been a focus for tropical ecologists in the recent times (World Resources Institute, 1985; Cintra and Horna, 1997). Enhanced synecological studies on forest management for a satisfactory regeneration option requires reliable information on the status and conditions of each forest interpreted from a broad context and change in forest conditions over time (Reed, 1999) coupled with a good knowledge of the history, species composition and ecology of the forest (Bob, 1992) and an understanding of the degree of species interdependence within communities, especially the timber and the non wood forest products (Leakey, 1999; Ayuk et al., 1999; Fondoun et al., 1999). Gehlhausen et al. (2000) and Jerry et al. (2002) observed that forest edges consist of micro environments that provide habitat for array of species different from those in the forest interiors. Such attributes could be light, air temperature, soil moisture and humidity. Biotic components such as seed dispersal may also give rise to changes in species composition from forest edge to interior. Distribution of individual species as well as changes in plant community composition estimated with a similarity index, indicate that competition may also influence the response of the vegetation from the edge to the interior gradient. Agulli forest reserve over the years has been under pressure with agricultural and other human activities bordering the forest reserve. Therefore, the objective of this study is to undertake the evaluation of the floral composition of Agulli forest reserve through edge and interior analysis. The knowledge of the synecological status of this forest is imperative for appropriate management options for the regeneration of the floral diversity. The study area: The study was carried out between 2006 and 2007 at Agulli forest reserve in the Northwest Province of Cameroon. Agulli forest lies between longitude 9° 10´ and 10° 20´ East and latitude 6°10´ and 6° 31´ North. The climate is that of a rainforest type with high humidity, high daily temperatures and high sunshine with average rainfall of 1250 mm annually which last for more than eight months of the year. Volcanic soil is prominent, while the rest of the soils are clayey and exhibit ferric properties. 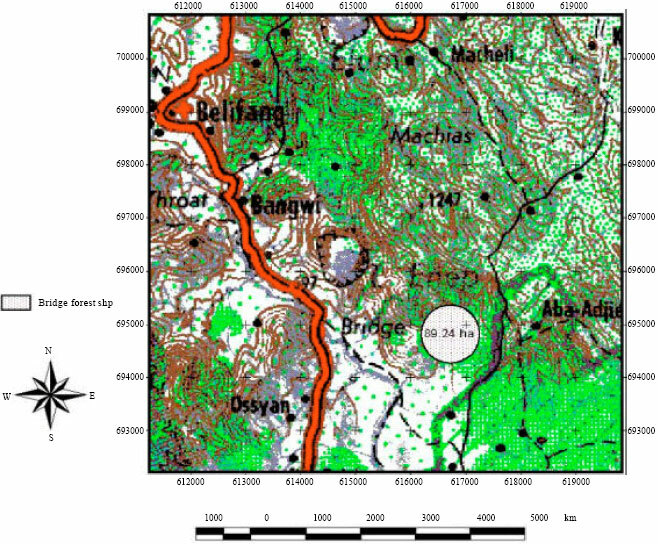 Demarcation of sample plots: Using a sampling intensity of 2.2%, two sample plots of 1 ha each were demarcated in Agulli forest with total land area of 89.24 ha (Fig. 1). One plot was located (695 m West and 616 m South) at the left exterior edge, while the other plot was located (617 m South and 694 m West) in the interior of the forest. Each demarcated plots were thereafter divided into 20 subplots (20x25 m). The layout out of the subplots is shown in Fig. 2. In each subplot, all trees that were 10 cm dbh and above were identified and their dbh measured. The tree identification was made by the use of information from herbarium documents and texts (Vivien and Faure, 1985). Within each of the subplot at the edge and interior of the forest, parameters such as minimum area; species diversity-dominance index; importance value index and regeneration status were assessed. Determination of minimum area: The determination of minimum area was carried out following the procedure of Barbour et al. (1987). After having identified all the species in the two main plots, separate list of species composition were established for each of the 20 subplots in each of the forest edge and interior. Thus each site (edge and interior) had 20 lists comprising the species with dbh of 10 cm and above. Beginning from the first subplot of each site, the first list was drawn-up with all the species enumerated appearing. The second list constituted all the species not found on the first list, that are the additional species. This procedure was repeated up to the 20th subplot of each of the main plot. The cumulative number of additional species found in progressive subplots was plotted against the subplot number to produce a line graph for computing and comparing the minimum values in the two main plots (edge and interior of the forest). where, C is the summation of the proportion of all individuals tree present and Pi is proportion of all individuals tree belonging to species i. This method was adopted from Keith and Laumonier (2000). Chi-square test was used to compare the diversity/dominance index between the edge and interior flora in the forest. A t-test to determine the differences among these size-classes between the two main plots (edge and interior) was carried out. Minimum area determination: Figure 3 and 4 show graphs of the cumulative number of additional species against the increasing number of subplots sampled at the edge and in the interior. As shown in the Fig. 3 and 4, the forest edge has no clear-cut minimum area. As the number of subplots increased, more and more additional species were found. Thus there were increasing number of new species from subplot 1 to 20 (Fig. 3). In the interior, a gradual increase in additional new species is observed from subplot 1 to 12. Thereafter, there was a slight increase to subplot 14, which flattens to subplot 20. No additional species were found subplot 19 and 20 (Fig. 4). From this curve, the minimum area was determined subplot 14 which has an area of 700 m2. The forest edge in Aguilli forest therefore, has no minimum area which can be taken to represent the entire community. Species diversity/dominance index values: The dominant species in the forest edge of Aguilli were Cola laterita and those classified as unknown. Both species contributed 21.5% each to an overall dominance index of 0.18. The dominant species in the interior of Aguilli forest was Canthium sp., which contributed 54.2% to an overall dominance index of 0.78. A Chi-square test performed to compare the species diversity of the two sites shows that, although species dominance index C, is higher in the interior than at the edge, the values were not significantly different. Importance value: The edge of Aguilli forest had 20 families, with the family Euphorbiaceae having the highest importance value of 64.9 (Table 1). This family had the highest relative density of 15.3 and the highest relative cover of 41.6. The relative frequency of Euphorbiaceae was 8, which was the same with the following families: Mimosoidae, Bignoniaceae, Ceasalpinoidae, Sterculiaceae and Olacaceae. Fourteen families were identified in the interior of Aguilli forest, with the family Bignoniaceae having the highest importance value (101.5) (Table 2). This was followed by Moraceae (98.9), Myristaceae (98) and Rubiaceae (90.7). In the forest interior, Euphorbiaceae had an importance value of 32.2, a relative density of 5.4 and a relative cover of 18. The families with the lowest importance values were Chrysobalanaceae (5.4) at the forest edge and Compositae (7.1) in the interior of the forest. The forest interior generally had families with higher importance values than the forest edge. Regeneration status: Table 3 is a summary of the number of trees found in the different size-classes at both the forest edge and in the interior of the forest. Within selected subplots at the forest edge, the highest number of trees (40) fall within size-class 51-100, followed by 26 in size-class 10-50. The same trend is observed in the interior of Aguilli forest, with 65 trees in size-class 51-100 and 39 in size-class 10-50 (Table 3). The t-test conducted to compare the edge (site 1) and interior (site 2) variables indicate that there are no significant differences among the size-classes. The two sample areas, edge and interior, showed compositional differences in most of the parameters investigated though there were no significant differences. The dominance concentration index, which is inversely correlated with species diversity (Barbour et al., 1987), was in this study, higher in the interior, than at the edge. This depicts that species diversity is higher at the edge than in the interior. The Chi-square test shows that there were no significant differences among species diversity values between the two sites. However, the dominance concentration index value is significantly different between the two sites. The difference in the number of species between the edge and interior sites of Agulli forest agree with Jon (1999) and Gehlhausen et al. (2000) both of whom earlier indicated that forest interior and edge microenvironments differ. Most species are influenced by light (Jon, 1999) and as such, with more light at the edges, Agulli forest edge has higher species diversity than the interior. Several abiotic factors of micro-environments change across the entire gradient, thus influencing species diversity (Jon, 1999). According to Gehlhausen et al. (2000), the relative humidity is higher at edge, while light and soil moisture has the steepest gradients. Edges bordered by agricultural fields have more extreme changes in microenvironments than those bordered by trees. Agricultural lands border Agulli forest and thus such changes may influence dominance concentration attributes between edge values and interior values, thus agreeing with the findings of Gehlhausen et al. (2000) and Jon (1999). Biotic factors such as seed dispersal and competition for decomposed litter also give rise to changes in flora composition between edge and interior (Nigel et al., 2000). Importance value indices are always useful in regeneration programmes because if these values are not commensurate to usefulness, some species or entire families could be eliminated from the forest and the forest, maintained through the most appropriate silvicultural system (Pascal and Pelissier, 1996). Importance values could also determine the level of dominance of family or species in terms of relative basal area and relative density (Pascal and Pelissier, 1996). At the edge, the family Euphorbiaceae has the highest Importance value index, while Bignoniaceae has the highest in the interior. Some of the species in these families could be very competitive and best adapted under conditions of low light intensity thus out-competing the fewer more useful species requiring higher light intensities. Bob (1992) reviewed the competitive nature of grasses at the forest edge with forest species especially at the period of seedling establishment. Bob (1992) claimed that the competitive vigour of the non-forest species for factors such as water, nutrients, space and microbiological factors of soil probably gives rise to forest edges having a lower dominance concentration value and thus, a higher species density. This could probably explain the overall higher species diversity at the edge of Aguilli forest. The interior flora of Agulli forest has a higher dominance index with lower species diversity, probably, owing to the superior shade-tolerant adaptive nature of the fewer species, out-competing and subsequently eliminating the weaker species or pushing them gradually to the forest edge. Thus the postulate that there are more interior species at the edge than edge species at the interior (Whittaker, 1975), holds for Agulli forest which has an increasing cumulative number of additional species as one moves from one subplot area to the other. Establishment of young plants after germination is not much of a problem in Agulli forest. This was observed from the non-significant values of the lower size-classes between the interior and edge sites. However, the species at the edge are subjected to competition from grasses and circulation of air since they are bordered by agricultural lands (Lugo, 1997; Gehlhausen et al., 2000). This flow increases moisture stress in the soil through higher transpiration and evaporation rates and thus creating xerophytic conditions, which lead to a poor germination of seeds and a slower establishment of the younger trees as well as their movement into higher size-classes. The higher air circulation may have its advantage in reducing moldiness and fungal attack and therefore aid better seed viability. Trees in the interior of the forest do not experience such stress conditions thus it was expected that a higher proportion of the lower size-class trees developed into higher size-classes and thus, agreeing with the report of Harper and Ellen (2002) on the structure and composition of edges being different from the forest edge. The non significant difference between the two sites in size-classes however, can be attributed to biotic disturbances such as competitive interaction at the edge between grasses, agricultural crops and other edge trees, coupled with intense competition for abiotic resources, while within the interior, it can be attributed to the adaptive nature of the fewer species to less intense abiotic factors (Luken et al., 1997). This leads to the more adaptive species in the interior, eliminating the lesser adaptive ones and hence fewer higher size-class trees. The TSS has been practiced in many tropical forests and has proven successful (Lof et al., 1998; Loftis, 1990). This system will be good for Agulli forest since creating canopy gaps at successive stages will give an assessment of seedlings and seeds present on the forest floor and the rate at which these can re-establish in new conditions. The enrichment planting system is recommended as alternative for the development and regeneration of Agulli forest. Gaps can be created in the forest and the seeds and seedlings of the desired species introduced in these gaps. This method has proven successful in the Australian subtropical rainforest (Igor et al., 2000). Ayuk, E.T., B. Duguma, S. Franzel, J. Kengue and M. Mollet et al., 1999. Uses, management and economic potentials of Garcinia kola and Ricinodendron heudelotii in the humid lowlands of Cameroon. J. Trop. For. Sci., 11: 746-761. Barbour, M.G., J.H. Burk and W.D. Pitts, 1987. Terrestrial Plant Ecology. 2nd Edn., Benjamin/Cummings Publishing Co., California, USA., ISBN-13: 978-0805305418, Pages: 600. Bob, E., 1992. The regeneration of highland Eucalyp forests in Tasmania. For. Prod. Newslett., 6: 1-6. Cintra, R. and V. Horna, 1997. Seed and seedling survival of the palm Astrocaryum murumuru and the legume tree Dipteryx micrantha in gaps in Amazonian forest. J. Trop. Ecol., 13: 257-277. Fondoun, J.M., T.T. Manga and J. Kengue, 1999. Ricinodendron heudelotii (Djansang): Ethnobotany and importance for forest dwellers in Southern Cameroon. Plant Genet. Resour. Newslett., 118: 1-6. Gehlhausen, M.W., C. Schwatz and K. Augsprger, 2000. Vegetation and microclimate edge effects in two mixed-mesophytic forest fragments. Vegetatio, 147: 21-35. Harper, K.A. and S.M. Ellen, 2002. Structure and composition of edges next to regenerating clear-cuts in mixed-word boreal forest. J. Vegetation Sci., 13: 535-546. Igor, D., F.R.P.B. David and L. David, 2000. Ecological processes maintaining differential tree species distributions in an Australian subtropical rain forest: Implications for models of species coexistence. J. Trop. Ecol., 16: 387-415. Jerry, F.F., A.S. Thomas, U.P. Robert, B.C. Andrew and A.T. Dale et al., 2002. Disturbances and structural developments of natural forest ecosystems with silvicultural implications, using Douglas fir forests as an example. For. Ecol. Manage., 155: 399-423. Jon, C.L., 1999. Tanzanian forest tree plot diversity and elevation. J. Trop. Ecol., 15: 689-694. Keith, R. and Y. Laumonier, 2000. Species diversity structure analysis at two sites in the tropical rainforest of Sumatra. J. Trop. Ecol., 16: 253-270. Leakey, R.R.B., 1987. Clonal forestry in the tropics-A review of developments, strategies and opportunities. Commons, For. Rev., 66: 61-75. Lof, M., P. Gemmel, U. Nitson and N.T. Welander, 1998. The influence of site preparation on growth in Quercus robur L. seedlings in a southern Sweden clear-cut and shelterwood. For. Ecol. Manage., 109: 241-249. Loftis, D.L., 1990. A shelterwood method for regenerating Red oakin the Southern appalachians. For. Sci., 36: 917-929. Lugo, A.E., 1997. The apparent paradox of reestablishing species richness on degraded lands with tree monocultures. For. Ecol. Manage., 99: 9-19. Luken, J.O., L.M. Kuddes and T.C. Tholemeier, 1997. Response of understory species to gap formation and soil disturbance m Lonicera maackii thickets. Restoration Ecol., 5: 229-235. Nigel, C.S., V.J.T. Edmund and D.K.F. Isolde, 2000. Edge effects on litterfall mass and nutrient concentrations in forest fragments in central Amazonia. J. Trop. Ecol., 16: 853-863. Okafor, J.C. and A. Lamb, 1994. Fruit Trees, Diversity and Conservation Strategies. In: Tropical Trees: The Potentials for Domestication and the Rebuilding of Forest Resources, Leakey, R.R.B. and A.C. Newton (Eds.). HMSO., London. Pascal, J.P. and R. Pelissier, 1996. Structure and floristic composition of a tropical evergreen forest in South-West India. J. Trop. Ecol., 12: 191-214. Philips, P.D., P. Celso and I.S. Thompson, 2002. An ecological model for the management of natural forests in the Tapajos region, Amazonian Brazil. JNM Silva, pp: 1-36. Reed, F., 1999. Enlightened forest management. For. Ecol. Manage., 115: 135-146. Smits, W.T.M., I. Yasman, D. Leppe and M. Noor, 1990. Summary of Results Concerning Vegetative Propagation of Dipterocarpaceae in Kalimantion, Indonesia. In: Breeding Tropical Trees: Population Structure and Genetic Improvement Strategies in Clonal and Seedling Forestry, Gibson, G.L., A.R. Gniffin and A.C. Matheson (Eds.). Oxford Institute, Pattay, Thailand, pp: 449-450. Vivien, J. and J.J. Faure, 1985. Arbres Forets Denses d’Afrique Centrale. Agence de cooperation Culturelle et Technique, Paris, France. Whittaker, R.H., 1975. Communities and Ecosystems. 2nd Edn., Macmillan Publishing Co., Inc., New York. World Resources Institute, 1985. Tropical Forests. A Call for Action, Part 1. Report of an International Task Force Convened by WRI, World Bank and the United Nations Development Programme. Library of Congress Catalogue, pp: 19-49.